Havarti, Ham, and Pear Crostini - Home. Made. Interest. 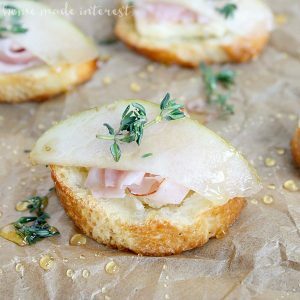 This Havarti, Ham, and Pear Crostini is a simple appetizer recipe for your next dinner party. This week I have appetizers on the brain. I know I’ve said it before but Melinda and I both are kind of finger food addicts. If you can make something bite-size we are all about it! We’ve shared a list of some of our favorite bite size appetizer recipes with you, and we’ve also got a list of go to New Year’s Eve appetizer ideas, but we still used upcoming Christmas and New Year’s parties as an excuse to cook up some new, simple, appetizer recipes. You might remember the Blue Cheese, Fig, and Pancetta Crostini Melinda made a few weeks back. I loved the fresh fruit with the strong cheese and salty pancetta! They were so simple to make and it got us thinking about other cheese and fruit pairings that would be delicious served on a simple crostini. I have to give credit to Melinda for this one too. She combined fresh pear, ham, and Havarti cheese, with just a little drizzle of honey. Delicious! The Havarti is much milder than the blue cheese we used with the fig so it didn’t over power the fresh, light taste of the pear. The ham added just the right amount of saltiness to the whole thing and those few drops of honey brought out the sweetness in the fruit and ham. I told Melinda I loved the flavor combination so much that I could see cutting a baguette lengthwise and using the same ingredients to make a simple sandwich for a light lunch. This simple flavor combination makes a delicious appetizer recipe. Havarti cheese, ham, and pear layered on a lightly toasted crostini. 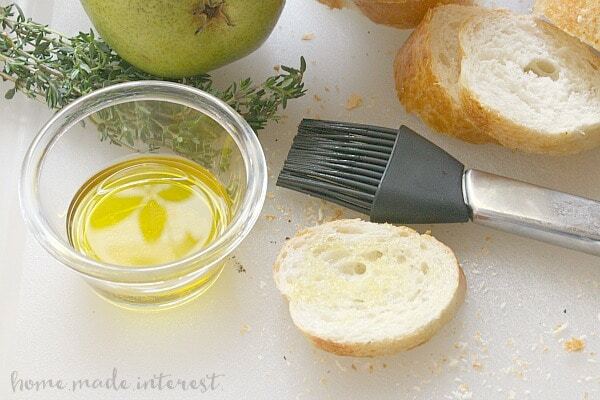 Cut baguette into ½ inch slices, brush with olive oil on both sides and bake on ungreased baking sheet for 12-15 minutes. 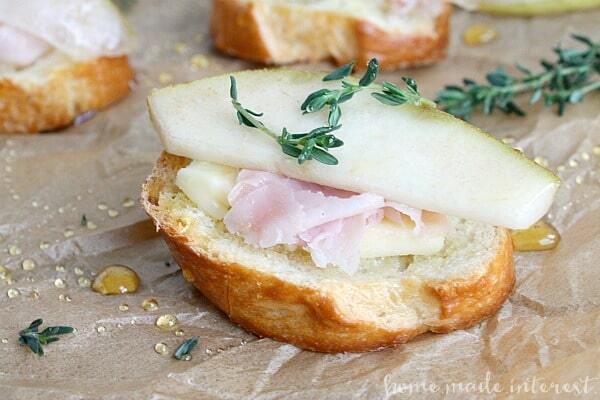 Layer cheese with ham, pear slice and thyme. So I’ve got these and mini lasagna rolls on my list for appetizers to bring to a NYE party. Sounds good right? I cant’ wait! I hope you all enjoy the holidays with your friends and family. Happy New Year!